Three weeks before Comrades last year, I was feeling antsy – jaded by the volume of training through the winter and spring, I couldn’t wait to get to the Comrades start line. This year is very different. Feeling under-trained, I wish I had an extra month to fit in a few more long runs and hone my speed. I’ve enjoyed the best week’s training of the whole year – 73.8 miles covered including my longest ever training run of over 31 miles. Thankfully, my injury problems appear to have abated. I had an appointment to see a specialist sports Doctor on Thursday. Because of a lot of faffing around with the physio and my health insurer, it had taken the best part of five weeks to arrange the visit. Five weeks ago I was thoroughly injured and not expecting to run Comrades. By Wednesday I realised that I didn’t feel injured anymore and I saw little point in seeing the Doctor. The worst he could say was that I shouldn’t be running a hot, hilly 56 mile Ultra with a dodgy achilles. So I cancelled. To protect my achilles, I have been running very slowly, shuffling around the streets of North Leeds in my voluminous Hoka shoes, my heart rate rarely exceeding 135. On Saturday, I dared to cast aside the Hokas, put on my Newtons and give it a real go at Woodhouse Moor parkrun. I didn’t know what to expect, I was hoping to go sub 19, sub 18:45 would be a bonus. I felt a rare prick of nerves on the start line – it’s been a long time since I have ‘raced’ (I know parkrun isn’t a race, but I use it as a verb, not a noun). I’d almost forgotten how gut wrenchingly hard a full-out 5K is. Basically it involves catapulting yourself into red threshold territory and holding it there for all you are worth. It was a large field of around 450 and lots of fast lads hared off way too quick in the first two kms. I simply didn’t have the speed to stay with many of my usual peers. In horse racing parlance, I was off the bridle and couldn’t layup with the pace. The hectic start started to catch a few out and during the second and third lap I was passing a few runners. 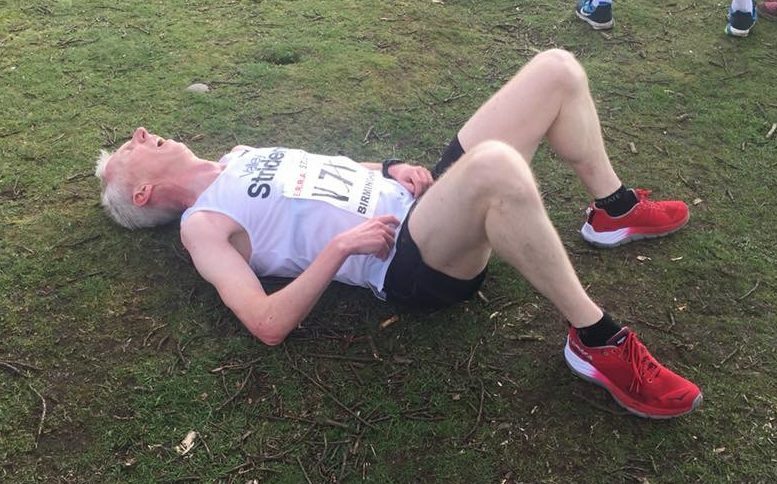 During the final uphill kilometre I could feel a fellow parkrunner sitting right on my shoulder, sensing that he intended to mug me in the finishing straight. I am nothing if not competitive and with 300ms to go I opened up my sprint, unfortunately not quick enough to shake him off. I dug in again and kicked near the line to just pip him and we both flopped over the metal barrier after the finish line coughing and wheezing. My time was 18:34, which I was delighted with. It’s a minute slower than my 5K PB, but given my build up it represents good progress. Many of my Valley Strider team-mates were running the Leeds Half Marathon on Sunday morning. I didn’t have an entry – through being injured in the build-up and my aversion to the £35 entry fee. I opted instead for a final extended long training run. Luckily, one of my team-mates Sarah wanted to recce the route for the Otley 10 mile race – a very hilly local race held on a summer’s evening in early June. Leaving at 7:45 a.m., I ran the 6 miles from home down to Otley to meet Sarah and we set off. It was nice to have company for the first part of my long run. It soon felt very warm – into the 20s and thankfully, I took a drinks bottle with me, replenishing it later in Asda and Morrisons, along with a purchase of bananas and a box of 6 cereal bars for a quid (Shopping tip: it’s amazing what bargains you find on the bottom shelf of supermarkets). After running the Otley 10 route, I eschewed Sarah’s kind offer of a lift home and set off the long way home through Guiseley and Horsforth. After about 24 miles I was entering Bonksville, and adopted a run-walk strategy (something I will have to do earlier at Comrades), but I dug in to complete 31.1 lumpy miles (satisfyingly exactly 50 kilometres in exactly 5 hours). I’ve spent the rest of Sunday curled up on my Laz-e-Boy watching cycling and eating Kettle chips. I think I’ve earned that.